I feel like I haven't been a proper 'shop' in ages - you know, when you just decide to hate everything in your wardrobe and buy enough stuff to just fill it all over again? Okay, so maybe I've never quite bought that much in one go, but my credit card is getting itchy and I'm in need of a good splurge - maybe because the exchange rate was so bad when we went to New York last month that I really didn't buy anything like as much as I thought I would have, and I'd spent months before that barely buying anything because I was saving for NY. Whatever the reason though, I have a wishlist as long as my arm right now and I thought I'd share the things I want the most from it. First of all this green jumper is absolutely beautiful - it would match my green Kate Spade bag that I showed in this video beautifully. 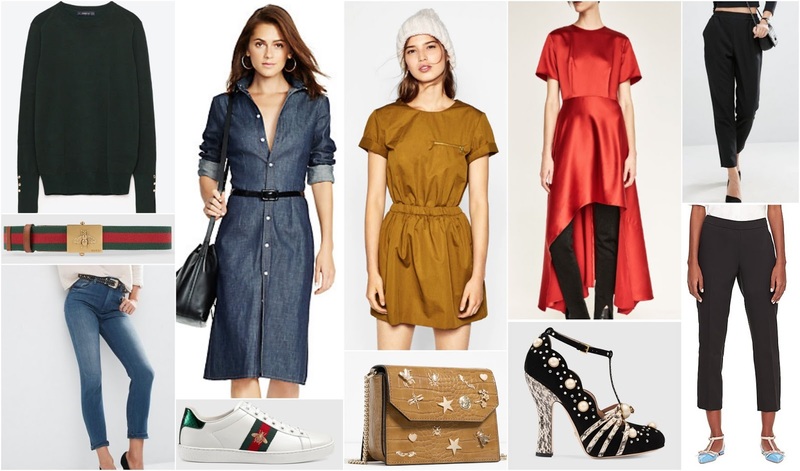 I've featured the bee buckle belt before in this post here, and again I've featured the same Ralph Lauren dress in this as I did in that one, because I think the belt and dress would just pair up beautifully. In addition to matching the dress though, I think the belt would look fantastic with these jeans, have the jumper tucked into the high waist to show off that adorable belt and then pair with the matching trainers - pretty and practical! For days when I didn't want to carry as much as my Kate Spade bag allows I feel like this little cross body bag from Zara would be a perfect match in with the bug theme, and the yellow would tone in nicely. The bag would also look gorgeous with the playsuit that I've shown directly above in the collage - again from Zara. With some black tights, black ankle boots and my double pom-pom hat that I showed here I think this could be a totally winter appropriate outfit for all that Christmas shopping I haven't started yet! For the actual Christmas parties there is nothing more fantastic this season than these shoes. Just. Look. At. Them. I am totally, officially, 100% in love. I think they'll take any plain old LBD up several notches - I'm envisioning them with the Ted Baker Langley collection dress I showed here, but I think they'd also look fantastic with the outfit I've got in mind for this year's Christmas parties. That outfit's main part is, of course, that fantastic red dress/top-hybrid-thing you can see above the shoes - it's not ridiculously short so some people will probably wear it as a dress, but I actually love the idea of pairing it with slim line, ankle grazing trousers (and of course, Those Shoes!) I'm always into whatever Dior does and I do believe it was Dior who pioneered the dress over trousers look a few years ago - and it's still going strong. The problem will be finding the right trousers - I need a pair that are very slim-line to go under the dress - no one needs any extra bulk to stick through that sateen material, so I've got two options. The top ones are an affordable pair from ASOS, I love the slightly relaxed fit on these and they look like they'll be super comfy - but they might be too bulky at the hips... So the other pair are slightly more expensive, but don't have the same excess fabric and may sit better under the dress! Always good to have options!